The San Juan Skyway is one of the premiere scenic routes of the American West. It traces a 233-mile loop through the heart of the spectacular San Juan Mountains in Southwest Colorado. It features vistas of hundreds of peaks over 10,000 feet (3,250 meters) with numerous 14,000+ feet peaks, four passes over 10,000 feet with tremendous views, the historic Victorian mining towns of Durango, Silverton, Ouray, and Telluride, and a fabled history. 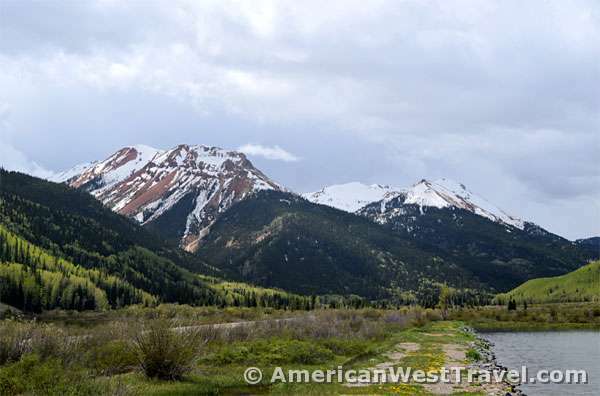 The most famous and spectacular segment of the San Juan Skyway is known as the Million Dollar Highway, connecting Durango, Silverton, and Ouray. The name refers to the mineral riches extracted from these mountains in the late 19th century, most incredibly from the historic Red Mountain Mining District. Today, a roadside exhibit just north of Red Mountain Pass (elevation 11,018 feet) tells its story: men and machines battling a remote and rugged alpine wilderness and succeeding, a classic story of the historic American West. Below is a panorama of the Red Mountains – three peaks named Red Mountain, the highest being 12,890 feet – encompassing the heart of Red Mountain Mining District. The interpretive display beneath the photo shows the numerous mines and town sites of the late 19th century. We’ve added an “M” for mines and “T” for town sites. The mines are Guston, Robinson, Yankee Girl, Genessee, Vanderbilt, Diana, and Idarado. (There were actually a total of about twenty mines and tunnels.) The towns (which no longer exist) were Ironton, Guston, and Red Mountain Town; three additional boomtowns were nearby. The Silverton Railroad, the “little train that could”. The black line in the interpretive display marked “RR” was the route of the fabled Silverton Railroad, called “the steepest, the crookedest, and the best paying road (railroad) in Colorado” by its Chief Engineer, Charles W. Gibbs. Its interpretive display explains, “The eighteen-mile Silverton Railroad was truly a ‘little train that could.’ Incorporated by Otto Mears on July 3, 1887, this narrow gauge railroad connected the towns of Albany, Ironton, Guston, Red Mountain Town, Congress (Red Mountain City), and Chattanooga to the bustling city of Silverton. 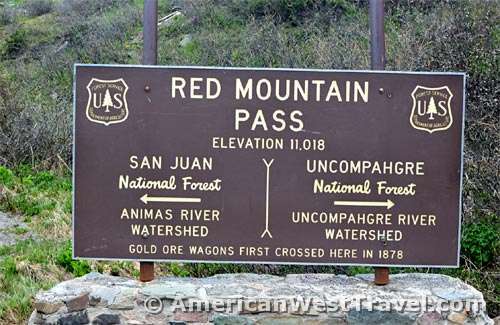 The railroad had four wyes, a switchback with a covered turntable, a 200-degree loop, and an average grade of 5% over the 11,113 summit of Red Mountain Pass. “Before 1900, the Yankee Girl was recognized as one of the most valuable mines in the United States. On the east side of Red Mountain Creek is the headframe of the Yankee Girl Mine.. In 1882, prospector John Robinson discovered a massive “pipe” of silver ore and staked the Yankee Girl claim. He developed an exploratory shaft and found that the nearly vertical ore body contained an enormously valuable vein of silver. “Unlike most local mines, the Yankee Girl shaft went nearly straight down – 1,200 vertical feet. Eventually twelve levels were developed below ground. In places, silver ore assayed as high as $10,000 per ton making the Yankee Girl one of the richest concentration of silver ore in the United States. Ore from the mine was of such a high grade that it bypassed the concentration mill and went directly to the smelter for processing. “Below you a 5½-mile tunnel connects the Idarado Mine with the town of Telluride. The Idarado Mining Company was founded in 1939 in a consolidation of mining claims including the Black Bear, Treasury Tunnel, Barstow, and Imogene mines. In June 1943, work began to extend the Treasury Tunnel below the Black Bear Mine to extract lead, copper, and zinc ore. As the miners drove further into the mountain, the Idarado acquired additional properties including the Ajax and Argentine Mines. “At the same time the Telluride Mining Company acquired the Smuggler, Ansborough, Flat, Liberty Bell, and Pandora mines. In addition, they negotiated a lease with the Tomboy Mine, giving them access to the Montana, Argentine and Tomboy mines. To improve access and remove ore, they drove the Mill Level Tunnel from the Pandora Mill. The Idarado Mine Trestle, visible in the photo at the top of the page, was used to move ore from the mine to a concentrating mill located in the hill below the trestle. After the mill was dismantled, the trestle was used to remove and dump waste rock from the mine. The towns were Albany, the terminus of the Silverton Railroad, Ironton, a large town on level ground (with 300 buildings to start! ); Guston, a scattered community in the hills supporting a number of mines; Red Mountain Town (aka Rogersville), a more developed town with 600 people just north of Red Mountain Pass; Congress (aka Red Mountain City), built just south of Red Mountain Pass and lasting only a year, as most of the action was further north; and Chattanooga (originally Sweetville), the staging area for supplies coming up from Silverton which was the prominent city in the region.